Before joining Texas Radio Dave played in a number of bands including Room 101. He comes from a family of musical siblings. On the day Dave auditioned for Texas Radio he was the first name on the list. Joe and Phil liked him so much they cancelled all the others right there and then. 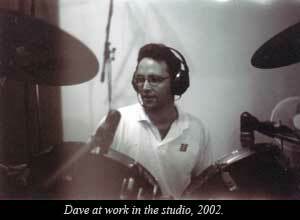 Dave's fairly quiet, except when he's on the kit. He’s not only an inventive drummer but he's also a very good guitar player. He has an abundance of musical taste. He knows when and what to play and he knows how to play it. He’s not afraid of the big topics either and he’s a joy to be on the road with. He is one of nature’s gentlemen. In between stints with the Radios Dave has kept his chops up playing in bands like U-boats and currently he works weekends with Newcastle cover band Vdubs. 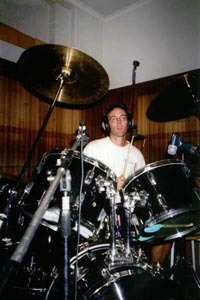 As well as recording with the Radios he has played a number of dates in various studios in town taking the drum seat on Peter Mackie’s second solo album. For his day gig he’s been a practicing lawyer with two of Newcastle’s largest law firms since he graduated in 1990. He opened Carruthers Solicitors in May of 2002.